I welcome 2018 in an idle state of mind. I wrote elsewhere that reflecting on the year that passed did not come natural this time, and it still holds true. Every time something important (and even unimportant) happened, I talked it over and in detail and the matter ceased to exist or bother. When and if it didn’t, I blogged. For resolutions, I found that for me writing them publicly almost equals condemning myself to failure. Sure, I can tell you I plan to create routines, and practice Japanese, and write diligently every day (just like I recommend my students to do, hypocrite), and study something new, and so on and so forth. The truth is known – I likely won’t. I do crave writing though, so on this cloudy yet beautiful day on a beach somewhere in Myanmar, instead of starting off the year with a post that is doomed disappointment, I will muse and ramble. No shame in that. I feel proud when I see former students writing in perfect, complex English sentences on social networks. By “proud” I mean proud of their effort and success. At the same time, I feel just as proud when I see former students writing in short and simple English sentences on social networks, because it takes courage to start and overcome the barrier, even if the wall is digital. Last year I sounded critical far more often than I intended to, in various situations related to work. If I made resolutions, one would be to breathe deeply and give myself time before offering any opinions, however important they seem to be at the moment. In fact, especially when I feel that my opinion is the right one and thus so “necessary” to be shared immediately. I will keep practising deep listening. Related to the previous point, one of the presentations I’m planning to do this year will be about Buddhist ideas that impacted my teaching. I quite look forward to that. It should not be viewed as official statistics but I feel like the majority of my colleagues have part-time jobs in addition to the main, if not too demanding, full-time job in our university. People work as IELTS examiners on their one and only day off (Sunday), give classes in other universities or language schools, do translation work, etc. This leads me to contemplate my own strong choice of NOT adding more PAID work to my day. It is pretty clear to me that I love teaching, so why wouldn’t I teach more? Why wouldn’t I add more variety to the somewhat monotonous life within a unified curriculum, a classroom life that repeats itself day to day, week to week, semester to semester?… The answer to these questions to myself is, I enjoy exactly this. Having the time to leisurely stay at work after work and do things at my own pace; organizing reflective practice meetings each month and investing my time and energy in what is going to happen there, because it’s something I truly care about at the moment; curating and editing iTDi Blog issues on a *mostly* monthly basis; being involved in a few projects at work at the same time; presenting at conferences; organizing a conference; and doing my many hobbies off and on. It is good for me. But… might I enjoy a side job, too?… That’s something to ponder this coming year. In March I will go to Vietnam to give workshops and volunteer as a member of the Teachers Helping Teachers team (a JALT SIG I mentioned previously in my posts). Maybe I will decide it is what I want to be involved in more. Maybe I will like Vietnam so much that I will choose to live and work there. Maybe it is a passing stage and I will keep looking for what it is I want to do next with my career. In 2018, I’m open to maybes. Along the same lines, I recently heard from a colleague about opportunities to (volunteer to?) teach English to North Korean defectors. If there is a way to do it online, or on a short-term basis (my trips to South Korea are frequent but never longer than a week), I would jump at the chance. Finally, I want to apologise to all I have left waiting for something from me: emails, comments, responses to requests… I have not been very organized. It has not always been easy to face communication and/or making decisions. Sometimes I am efficient, other times I dread the pressure. Aimless, I step into 2018. I know I will try to be the best teacher I can and be kinder to my students, my colleagues, and myself. I want to try to keep up the rejuvenated spirit of socializing offline. I might try to be a better communicator online, too. It is kind of exciting to not have a big plan of what happens next and make adjustments on the way. It’s fitting this way now. Today’s blog post is a reflective practice meeting on paper. Let me explain. Here in Tokyo we hold monthly reflective practice meetings (and I mentioned those before in my previous blog posts, for example here). We tell stories and ask questions, trying to help each other look deeper and see more in what happened. Some meetings see more participants than others, some have two. Like today. And while it wouldn’t be unreasonable to have a chit-chat with Lina and call it a Meeting, we thought we’d do something special. We’d type up what we’d otherwise be saying. So here goes your Christmas present from RP Tokyo, a reflective conversation around a happy ELT story from a 2017 classroom. My happy story did not start so cheerfully. In fact, it started as one of the most challenging, trying classes of this fall semester. In a bunch of high level proficiency students, most of whom had either studied or lived abroad, there was one kid who seemed particularly… bored. Let’s call this student Bo. Bo’s casual English was nearly flawless. I could easily see Bo hang out with his mates in LA, London, Singapore, etc. and have zero problems getting the message across (a possibly timely note: Bo’s “mates” in my imagination would be 16-18 year olds). So back to our classes. From the very first lesson (and mine is a mandatory discussion class that HAS to be taken no matter how fluent and great you are at English), Bo looked like the class was about the worst possible way to spend time (yet, Bo only missed one class out of 11). Bo was the first person to grab the bag and leave the classroom the very moment the bell rang and I wrapped up the lesson. I don’t remember Bo ever saying goodbye to either myself or group mates – and the class size is eight students, so I would most definitely hear those words. In group discussions, Bo liked to sit back in the chair and waited to be asked to share opinion. Which Bo would quickly do – and return to the very comfortable if idle position. Needless to say I felt not a little annoyed and frustrated by Bo’s attitude. However, that class was a BUNCH, as I said, and it was a bunch of Bo’s and other. Every day I had to teach that class, I mentally prepared myself for a storm of emotions that I might have to go through. One such time it hit me pretty hard and I blogged about it. I didn’t really want to give up on them and all of the various issues I found myself experiencing when teaching this particular group. I tried to do something (or not do something I’d been doing) in class, hoping that a little change would work (for this idea in my mind I will forever thank John Fanselow). Yet it seemed like they could see through my intentional effort – and class went off the rails (for me anyway) in a totally different way again. Anyway, I did say it is a happy story, and so it is. After our latest lesson I was returning back to my office from another building on campus and I saw Bo, who I’d earlier taught that day. Bo was in a group of friends and engaged in a conversation… but as I was passing by, Bo made sure to say “Goodbye Anna” loud and clear enough for me to hear and react to. Right now as I’m typing this, I’m smiling. Such a tiny thing, you’d think. Coming from Bo, though, in a circumstance like that, it felt pretty great. Apart from our Discussion classes, do you have an opportunity to use English in your life right now? (By “use” I mostly mean speak, but please mention other ways you use it, too). When do you use English? How much (a week)? With whom? We only have 5 classes left. After that, you won’t have any more Discussion classes. This could be a good time to set a goal to achieve by the end of the course. What goal(s) would you like to set for yourself for Discussion class? What can you do to achieve this goal? Bo’s answers were eye-opening to me (and who knows, maybe to Bo, too…). Bo said that, having spent many years abroad speaking English every day in an international school, now there is NO chance to use English. Bo’s goal was to participate actively every class and ask group mates lots of questions (I’m obviously not quoting, so I think Bo formulated it even better, and with … mmm… heart put into it). In fact, all students in that class surprised me that time with how thoughtful they were, how genuine their response was, how openly and responsibly they took the questions. They inspired me to be more positive and have good faith in what we can all do together in class. I now don’t fear that class approaching. I like them and I think I will miss them when I have to say goodbye. I don’t think self-reflection or any other measure I took or didn’t take to turn things around in that particular class worked on its own. Frankly speaking, I’m not even sure how the next class is going to be. But I feel now it’s a happy story already. In group discussions, Bo liked to sit back in the chair and waited to be asked to share opinion. Lina: Why do you think this happened? Bo’s English is almost flawless, as you describe it, so it wouldn’t be difficult for Bo at all to participate in the discussions actively. What could have stopped Bo from doing that? Bo didn’t like being forced to take this class? Bo didn’t like the topics? Bo thought it was too easy? Anna: I observed Bo, even though I think for the first few weeks my vision was clouded with the frustration I felt about exactly this – having the means to do the thing and participate, and yet not having the desire to do so. I think this is a case when ability and willingness to communicate did not get to meet. For a while. It might have been conditions, or atmosphere, or mood, or class composition, or teenage rebellion… anything, really. Everything. and class went off the rails (for me anyway) in a totally different way again. Lina: It would be interesting to hear in what ways the classes went off the rails. In what ways did they ruin your efforts?.. Lina: I can’t wait for an update! I really want to get to know if this student achieves the goal or not. Will the usual behaviour change? I don’t think self-reflection or any other measure I took or didn’t take to turn things around in that particular class worked on its own. Lina: Do you think you managed to establish a good rapport with these students? Do you feel like they’re a unity now or still just a bunch? This post was brought to you by a #livebloggingparty featuring Lina and myself. Be sure to read Lina’s happy story in her blog here. Questions for discussion kind of post. Today’s blog post is not a typical post. It’s not even a paragraph-blogging kind of post. Rather it’s an invitation to discuss some questions that are on my mind today, so much that I can’t handle thinking of them alone. If you have something to say, I’d love to read your opinion in the comments below. Topic: A teacher’s responsibility for students’ successful performance. 1. How responsible are teachers for students’ successful performance of the target language they teach? 2. When do you know/feel you’ve done everything in your power to help students use the language? 3. How much control do/should teachers have over students’ ability to produce the desired output? 4. In the case of a rigid, institution-imposed assessment system, what should govern us more, our own beliefs about what “successful performance” means – or the institution’s idea? 5. What do you do when you realize/assume students’ (under)performance may be affected by your plan or your skills as a teacher? Thursday is the longest day. And yet, somehow today I had all the energy I needed to make it – three classes, each demanding a different focus of my awareness, different vibe to match and adjust to. Writing *semi* individual comments with feedback to each group. And then, a meeting of our Reflective Practice Tokyo group, after a three-month long break. And yet instead of being exhausted, I am typing up this post at 11 pm. Enjoy. What’s important in the beginning of the term? Individual notes on pieces of paper, throw in one bag. Draw and comment, hear ideas. Choose some, write an episode related (from recent weeks), talk to partners. LISTEN. ELC (Experiential Learning Cycle) back to work. So here’s the full list of important things that the six of us at this group meeting came up with. As I was typing it up, I was fascinated to see the variety of “zones” of significance for each of us, and how our current state in the similar (or completely same!) teaching context(s) is reflected in our current priorities. I wonder if anything from that list speaks to you, too. I was quite intrigued to see that almost all of the notes were different. As I was walking home, I couldn’t help but think how important it is to listen and hear what others have to say. The thing is, if I feel strongly about a certain aspect of teaching, I feel like my vision gets blurred and many other things will be overlooked, because the focus is elsewhere. I miss out on something else that’s important. For example, I’ve recently grown very passionate about the role of relationships and connections we form in our job, as well as the crucial value and importance of a teacher (brought about and fuelled by Sarah Mercer’s work and talks, including her recent plenary at IATEFL 2017 in Glasgow). I want to talk about this, read about this, bring this view into discussions whenever there is a chance… But being so “aggressive” about one thing probably distorts my perception of the other aspects of my job…? A Buddhist idea came to mind then, that people believe their opinions are so important and cling to them so fiercely… yet opinions change, so it really is almost a waste of mental effort. I wish I remembered this more often. So that’s where our reflective discussion (followed by somewhat reflexive thought) is leaving me at the end of the day. This time, and almost every time – be more open. Listen and hear. Distance from my own opinion – but that’s the hardest one. Last week, as I was meeting 107 students that I am teaching this term for the first time, I said in my introduction that I like writing and one of my dreams is to write a book and/or write a column. After saying this outloud a few times to different groups, I started feeling like a hypocrite – in truth, I haven’t written in ages. There’s always a show to watch, a mandala to colour, a sketchbook page to fill, – and always a book to read. While all those have become increasingly important in my life and bring me a lot of joy, I deserted my one true passion. 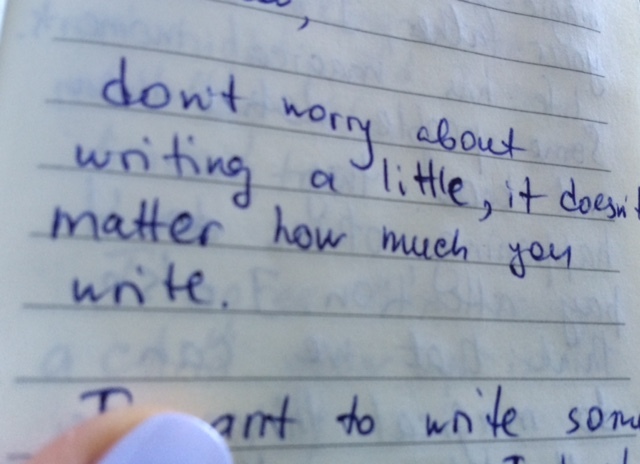 Writing always used to make me feel on edge, in a good sense. And caused many sleepless nights to my life, which I miss. I know I am in a different place now. But maybe I can lower the bar and just write some. Dialogic journaling. Part 1, notes. I would write about why I am not blogging anymore and how guilty that makes me feel deep inside. I would write how every day I choose other, less painful and effort-demanding hobbies. I would write how I keep finding ways to escape doing writing of any sort. I would make a good case for support and understanding (“We’ve all been there, hitting that writer’s block”). I can easily picture myself writing that. Instead, for what it’s worth, I will use this space to help me consolidate my ideas for another semester project paper. Purely practical reason, a writing I can’t delay any longer. This past semester I had to identify “an issue” in one of my classes and keep a reflective journal registering my observations and/or any changes I brought about regarding it. I wanted to experiment with the format and try a dialogic journal. Every Friday after the lesson with the group in question I would write an entry in a Google doc. Then my colleague, co-creator of Reflective Practice Tokyo group and friend Matt Turner (known as a TEFLologist to some of you) would read my notes and leave his questions in relation to what I’d written before. Since for my article I need to make sense of the 20+ pages of that document, I will write two blog posts trying to sift through to the bottom. Mostly copy-paste from that Google doc, with a few comments from now in italics, here and there. Some time in early October, the beginning of the term. Focus of my journaling will be ***** class. The class has multiple issues that make it challenging for me to feel comfortable teaching this group. Group dynamics, low level, low motivation, individual students’ problematic areas, lack of active response to teacher instructions and to teacher in general, etc. It seems like a perfect chance to apply the ideas from my teaching beliefs stated above. Nurturing a community seems a priority. A community that would ensure mutual support and understanding. A community responsive to each other and to the teacher. —> I need to think of ways to reach that level through (a) attention and help to individual students; (b) dialogue with students through micro-writing? (c) class reflections. My concerns: too many concerns in that class, too many issues that I want to “fix”. Don’t look at me unless I ask them to, sometimes multiple times. Slower pace, change certain tasks from regular classes. A selection of my own entries, written once a week on the day of the lesson. I can be diligent as needed. Lesson goals on the board – speak 100% English and be interactive (drew a scheme of an interactive discussion, with a mess of arrows and questions). Got too wordy/passionate explaining that. Sometimes spoke when some students were not looking at me. Felt frustrated to have to call their names and ask them to look at me. Did that A LOT in the first half of class. For the Deep End (presentation of target language) they did not start their discussion for a minute, looked at me and did not know what to do, so I had to stop and model the discussion with Sean. Then just explained the phrases. There were 6 students present, so group discussions consisted of three people. By the end of class the students grew more responsive to me. At the end of the lesson asked them to write on sticky notes what was easy and difficult today in class. Easy: only two people discussion; good reactions; speak in pairs; discussion with Brian, very interesting; talk about ways to learn English; talk with classmate, use communication skills. Difficult: giving different viewpoints; giving opinions; group discussion; ask questions; group discussion. Important note to self: remember to always ask your students. I didn’t make any changes to my original lesson plan and had students have a pair discussion (5 min) before a longer group discussion 1 with the same question. As I could hear, they were doing a fine job and discussed different viewpoints. Before discussion 1, I brought their attention to the fact that they each should ask at least 5 questions (and wrote them on the board). In group discussions, they almost never used reactions and didn’t ask many questions. We did a raise of hands on the questions asked. I opted out of doing a self-check so this was it for feedback. Right before discussion 2 I asked everyone to stand up and sit down only after giving me 3 reactions they would use in the next discussion. In both the following discussion and especially in the test everyone did great with reactions, to the point of exaggerating and causing laughter. Most students did well on the questions in the test as well. When students were discussing in Japanese which questions to choose for the test, they seemed comfortable with each other (laughing). Nobody spoke Japanese during the test. I try to remember to speak less and clearer. But after I explained to the second test group that they can take their time to choose good questions for the test, Lisa asked Tanya in Japanese what was it they were doing (I assume). I felt we’re warming up to each other (all). Especially so when we did reactions standing. They felt more relaxed. I’m never sure if Lisa understands what I’m saying and I don’t know how to check (when it’s not the task). I feel I should start speaking activities for them as soon as possible. Cut my talking and explanation time to an absolute minimum. But then how do I connect, get through to them in that case?…on a personal level. I mostly felt good in this class and about them, too. It took them longer to do things, but they were/seemed to be less confused than usual. Stats – count something (that matters at this particular lesson). In other classes I start the lesson by asking students if they checked any media in the morning and what they saw there and also share my own story. In this class I decided not to do this – on second thought, I should have done that. They could benefit from starting to talk from the very beginning of class. Other than that, I did not really change my lesson plan nor did they have any struggles! They were reasonably active and engaged in discussions, didn’t use Japanese! In fact, they performed really well and followed instructions straight away for almost every task. <…> At the end of class, I asked them to write easy and difficult points about the class again. One “bad point” Lisa’s discussion group mentioned in feedback was “slow discussion.” <…> I can notice that the dynamic of a group discussion, even if it is just 3 people, is significantly different from pair work. Slower and confused, indecisive as to who speaks and when. I never noticed or thought today that this class is “problematic.” When there was some confusion, I interfered and helped as possible. They figured out what to do quite quickly today and there was a nice feeling in the air, friendly and respectful. Function language was clearly presented on the board as a dialogue. Activate schemata for the lesson – by asking them questions or asking them to discuss some questions related to fluency and lesson topic. Include group work for stages other than group discussion (for example, Practice). Structure the discussion flow more clearly, especially the beginning. Write their good language on the board!! They often referred to the board today, where the key language was written. Think about the “slow discussion” – together?? Before the bell I tried to talk to them (“How are you?” for the most part). Lisa said she was genki, and in general there was some positive energy. Even though it was as quiet as ever before the bell. Next step was having them do the functions review. I said, “You can discuss and try to remember together” – nobody discussed, everyone worked individually. One more interesting point about Lisa today: the student she’s most likely to talk to in Japanese is Kim. Today in fluency she reminded him to speak English when he switched to Japanese. The same thing happened in discussion later. I felt relaxed in today’s class, for a change. There still was the same confusion as ever, but I didn’t react so negatively to it. It didn’t stress me out. There was some energy in this class, and even though discussions were slow, I talked to them about their strong points (many questions!!!) and weird points, HONESTLY, and we could laugh together. Coming to class ready for “something challenging or different” changes perspective. I wonder if I was more scared of them than they were of speaking English. During fluency, the speakers were completely silent for a long time. Same was true for the Presentation (30 seconds in silence), so I came up to each group and asked “What’s your opinion about this topic?” <…> They started with “I don’t know” but then slowly got the energy and spoke about America and Sweden. <…> As the class progressed, they could start the activities quicker. I felt relaxed for the most part. When they were silent, I just waited and realized that I didn’t feel as frustrated as before. They need more time to start. <…> Students seemed more on board with the lesson flow, even if confused at times, mostly at the beginning of class and at the beginning of tasks. Starting the timer does not mean start of discussion in this group. They take it as a start to organize themselves. So maybe…(1) We should clarify together what we’re going to discuss now and how we go about it (prompt them to the first few questions in discussion flow); (2) Start the timer when they actually start their discussions. Target language presentation created a big confusion. One group for 1 minute looked at the handout and in Japanese said the names of the people in the picture there. I came up and drew their attention to the question to discuss and asked, “What’s your opinion, Haley?” – but nothing happened after that. Finally, Sean began talking. In the end, I didn’t use the timer in the presentation at all, but rather waited for them to get where I wanted them to get… For the practice stage, again I gave them more time than planned originally. It was a very energetic class, we felt comfortable and laughed and understood each other (even if they didn’t always understand the task!…). They listened to me more, looked at me when I was talking, engaged with me, responded when I elicited ideas from them. At the same time they were still confused in the first part of class, often confirming with each other. My current thought – what is wrong with them confirming with each other?? They are obviously more comfortable with each other than before. Isn’t it what I wanted? I can’t wrap my head around the reasons for their repeated confusion over tasks in the presentation and practice stages (which, honestly, resemble one another from class to class)… Do you have any ideas?…. That’s what I asked Matt, my helpful journal companion. In my next post you can read quite a few of his questions based on the notes you’ve probably just read above. What a long post!.. And no conclusions drawn… I hope you don’t feel like you’ve wasted your time reading it, and I will secretly hope that some day somebody can find this post useful, whichever way that may be. If you have any questions or comments, please do leave them below. Bottom line: I don’t feel like I’ve wasted my time on the beach. On the contrary, I finally feel the burden slightly lifted. The tugboat is at work now, slowly picking up speed. Thank you for reading – and always supporting me. What Clark (school) taught me. It’s time to stop whining about not having the time to write and just make this time. It’s time to stop worrying so much about not being in good shape (was I, ever?..) for a long, thoughtful and well thought through piece of writing. It’s a perfect night for nighttime paragraph blogging, and maybe I can be back in the saddle. I shouldn’t expect myself to miraculously connect with the students in a different country/culture simply because I seem to do so quite easily back home. It took me around four months to establish and feel their trust. In those first months I was desperate, angry, frustrated, and scared. I couldn’t adjust my teaching style so easily, I had to let go of some of my beliefs, I had to open up myself and be sincere. I realized instructions matter. I think I no longer mumble and ramble over what’s got to be done, expecting students to “be smart and get it”. I realized students do not necessarily understand whatever it is I am saying. It can be unfair to assume they should easily all do so. Working true Japanese style, namely doing morning, evening, and 3-hour monthly meetings, requires stamina annd patience. I seem to have those. But then I don’t have the energy to read the blogs, or write myself. I feel drained. No matter how wildly you may believe that TOEIC and other exam scores focus is detrimental to learning, students will stay aimed at those. They will ask for practice and exercises and more worksheets, and it’s not their fault. That’s not even what they believe to be right, but rather the system they have to get through. Working with people requires soft skills that I found out I need to have developed. It’s not an easy ride even with the best of intentions. I possess character traits that I am ot proud of. I can get too forceful with my opinions, too direct, snappy, or even careless with my remarks. While I’m trying to hold these off and watch my act, it’s both painful and good to recognize my flaws. I think with this increased awareness, I am getting better at communicating. It is a process though, and I’m sorry for the times I might’ve hurt people on the way. I remember a conversation I had with my friend Kevin Stein a while ago, before I moved to Japan. He’d been a high school teacher for some time and I’d been a university teacher for 5 years. We discussed how different these jobs are in terms of emotional connection to students they offer. My students only saw me maximum twice a week, and most often for one semester only. No matter how much we enjoyed our classes, it seems like we all knew I’m just another teacher, one out of dozens they get to meet through their years at the uni. It seemed to have struck Kevin that the bond between me and my students, due to the very nature of a university class, was so weak. And I could not picture what kind of other bond he meant. Now I do. I cried when my high school kids went on stage to get their graduation diplomas. I cried and felt terrible to tell other students that I’d not be teaching them anymore. Being around these kids every single day just flipped the whole teaching experience for me, turning it into one of extreme emotional vulnerabilty as it approached the imminent logical ending. Cultural differences play such a big role in a classroom, and I have to get familiar with them as much as possible before I go and teach. An example off the top of my head is silence in response to my questions, or the challenge that spelling poses. There certainly are more, many more things that Clark (school) taught me, but this blog post is already too long. Thanks for reading and I hope to give you a reason to return here soon. Breaking: English in Japan is pretty useless. It’s hard to believe that I’ve been here for 10 months. There are 20+ other blog posts I should have commited to finishing writing about this time, but here’s what’s coming and some background story is likely needed. The part coming below is responses of third-year students to a task in their final test on the course. The task was to give a clear comment on three statements, which happen to be stereotypical ideas about the Japanese. As I was grading the tests, I couldn’t help it but be moved to blog their thoughts, accompanied by my own comments. I wish I could spend more time in class with these students. I wish we could talk about these things, among all others. Instead, I am offering the typed version of the conversations that never happened. Enjoy. English in Japan is pretty useless. A lot of people, even young people, don’t speak English. Even if they can, they will be too shy to speak when the chance comes. Yes! Yes! Yes! Actually, Japanese study English since they are junior high school students, but many people can’t speak English. Even if we can, we tend to not speak. I think Japanese hate to make mistakes. So they are afraid of making mistakes. We should be confident. We should adapt to globalizing society. Me: As hard as I might try in my class to help students feel more at ease about making mistakes, I know what you mean. There might be additional, contextually Japanese reasons intensifying the fear but maybe most learners are prone to that sort of reaction? Well, I myself certainly am. One of the many excuses reasons for my profound lack of Japanese speaking after a year living “immersed” in the environment is the fear of being misinterepreted, misunderstood, the fear of using a wrong phrase, sounding too casual, too incoherent. It’s little of a consolation, I know, but it is my way of offering empathy as a fellow language learner. I agree with this. Many people think so, including me. In my opinion, people think that Japanese English pronunciation is so bad to speak. English is still a “foreign” language for us, because we don’t use it much. Me: This comment made me cringe on the inside, feeling so sad and yet grateful to this student for spelling it out. Who are those people thinking so, saying so, instilling such thoughts in learners? Is Russian English pronunciation any “better”? When I was in Thailand, I took pains to understand Thai English, but not because it’s “bad” – it is just so different. It offered variations of sounds that my ear was not accustomed to. I wouldn’t want it for any of my students, Russian or Japanese, or wherever else I might go to teach, to feel ashamed of the way they speak English. I agree with these statements because I am shy to speak. Also, at first we learn English grammar. It causes us to feel “we have to speak English with correct grammar”. It also causes us to feel nervous and tense when speaking English. Me: Again, I just want to reassure you that both nervousness and tension while speaking any foreign language is such a natural, human reaction… The way I see it. It is a teacher’s job, to a great part, to make that stressful experience less so. I’m truly sorry we don’t always manage, or explicitly show that we care to manage. I agree with this stereotype. Japanese people usually start studying English when they are 11 years old. That’s why Japanese people are not good at English and speaking. Me: Russian people usually start studying English when they are 6-8 years old. Many of them still don’t find themselves to be good at speaking English when they grow up, even after 20 years of learning. I’m not sure what it proves. I don’t think that English in Japan is pretty useless because over 80% companies in Japan use English and in 2020 we’ll hold Olympics in Tokyo. At that time, many foreigners will come to Japan. So English will be considered to be an important skill. I do agree with the second sentence, because I do become shy when I speak English. In Japan people don’t use English in daily life so people tend not to speak English, even if they can. Me: I am with you and thanks for pointing out that good reason to keep motivation up for learning to speak English. As for the last sentence, it shouldn’t come as a surprise that people in most countries around the world don’t use English in daily life! What I am saying is that we’re all in the same boat here, and it’s good, and there shouldn’t be pressure to necessarily speak the language! I agree with this comment. As I wrote, Japan is an isolated country so we don’t have an opportunity to speak another language, not just English. We will be too shy when we try to speak other language. I have to say yes to this stereotype. To be honest, Japanese way of teaching English is horrible. They are looking at English as a tool to get a good grade on exam but not as one language. I think this is a reason why Japanese can’t speak English very well. This is one of the reasons why I didn’t go to a normal Japanese school. Me: Now this is analysing the “problem” on a whole new level! I am constantly left speechless at the amounts of testing that is happening throughout the term, as well as at the worksheets for English classes that I catch sight of in the staff room. All I can do is sigh, and yet you’re saying this is not a “normal” Japanese school..! I agree with this sentence. Japanese feel shy to speak English in front of other people because they have a little opportunity to talk with other people in English. Moreover, Japanese character is passive so they hesitate to express themselves. Me: This comment struck a cord with me. Is that so true? Is there something I could do in my class, in those few hours a week we spend together, to unlock the expressive side of that character (that I am certain exists in every teenager at the very least!)..? Or is that being too bold? I think Japanese people have no interest in foreign countries and if Japanese people spend their life in Japan, they think “I can live if I use only Japanese.” That’s why they don’t try to speak English so much. Even if they can, they try to be same with other Japanese people. Maybe they pretend to be shy. I agree with this sentence. First, in Japan people don’t have a lesson in which they can communicate in English. School teaches us how to write perfect grammar. So, a few people can speak English and during speaking are too shy. Me: There’s nothing I could add here… wait, no, I have a question. Don’t Japanese junior high schools have ALTs? I don’t have experience working as one or working in a school with one, so obviously my knowledge is limited to the stories I’ve heard… but it was my understanding that they were there in school to ideally produce some sort of English-speaking environment, or an impression of such. Just as a sidenote: Russian schools don’t have an equivalent of that position. I think so, too. These days a lot of foreigners visit Japan, so there are many chances to talk in English, but the way of studying English in Japan really focuses on writing too much <…> Japanese are shy to talk with strangers in English. I think it comes from the historical reason. Once upon a time, Japanese people used to keep distance from foreigners. I think that reason made people these days think they can’t get along with foreigners. That’s not true. I speak English every day no matter where I am. I partially agree with the idea that Japanese are shy though. It really depends on each person’s personality. If you are good at English, you can go to a good university, so it’s not useless at all. Thank you, reader, for reading. Make what you will out of this post. 1) I held a whole class in Russian. I gave instructions in Russian, gave comments in Russian, allowed conversations in Russian. Excuse: the level of the group is very low, much lower than the material that has to be taught expects them to be. The majority of students struggle (and I mean it, struggle) with recognizing spoken English, even the easiest English of instructions. The conversations that I mentioned above were 95% around the language issues we were dealing with. 2) I did not explicitly check homework I’d assigned. Excuse: I saw half the class were unprepared and today I didn’t feel like having an uncomfortable “strict teacher – lazy student” type of talk. We partially covered the homework material in the lesson itself. 3) I let the shy students sit through the class without uttering a word in whole 90 minutes. Excuse: The energetic students “seized” the lesson space (see point 11). 4) I let grammar mistakes slip off my students’ tongues and go uncommented or corrected. Excuse: Point 11. Some mistakes were made and quite a few times corrected on the spot by most active and confident students. Other times I took notes of points to pay their attention to later, but the lack of board, white or black, for that class (as we were studying in a corridor) imposed certain restrictions on my teaching. As the conversation drifted off and away from my grasp, my chance to voice out the comments from my notebook was missed (and, frankly speaking, plain forgotten). 5) I played an audio file which was way too hard for students. Excuse (and a comment): Without a specific task, I played the file “for the gist”, with an idea in mind to acquaint them with the podcast I’d long wanted to recommend. Previously they’d expressed interest in the idea of using podcasts for autonomous learning in their free time (their level being positively upper intermediate). My belief was (is?) that by demonstrating a tool/ activity/ learning opportunity in class you increase chances that students will actually pick it up and try by themselves. However, today we learnt that these very students are, in fact, not excited about any podcast-type, pure listening kind of language input. Three minutes was enough to put people to sleep. Video is the way to go, they say. One more important factor: the class was held in late evening, after a full working day, so unsurprisingly concentration levels could be at their lowest (both students’ and teacher’s). 6) My mind fell blank when students inquired for certain words and ways to express their idea. Multiple times. Excuse: Not a native speaker or a walking dictionary. Some days memory lets me down badly, much worse than it normally would. And of course the right word/ phrase lights up my brain on the way home, several hours after the moment of need. 7) I was late for class. 8) I spoke too much and offered too much of my own personal commentary. Excuse: I want to be part of conversation in my class, especially so when I have something to add and/or believe students will learn from what I say (either new info or new language). Students looked interested, reacted positively, asked for more info, added own relevant comments. 9) I did not use a warm-up activity. Excuse: It did not suit every class I’d planned. 10) I did not monitor group activity effectively. Excuse: See point 11. Also, by midday my headache had got stronger and I had to limit my own movement (aka sit on a chair)) so as to survive through the remaining classes. So I trusted my students to manage themselves and each other. 11) I let students take control over the lesson and followed their lead. Excuse: They were active, they were willing to share and participate, while I felt uncomfortable to interrupt their genuine desire to speak English with their groupmates (and teacher) during an English class because I had it differently in my plan. 12) Students did not move from their seats. Excuse: Come to think of it, in two out of 5 classes they did. Excuse (? ): Notably less sarcastic than I was 2 years ago, as I now pay more attention to my commentary. Time to finish the list now. A teaching day, once brought down to pieces like this, could drive an exhausted and sensitive teacher to a depressed state. Tonight I wanted to write about a long, hard day of a non-exemplary teacher giving not exemplary classes. Reading the points I jotted down a couple of hours ago in the metro, I come to a helpful (?) realization that some of these could actually be recurrent issues for me. I know my eye is twitching by the end of the day. I’m emotionally squeezed out and exhausted so much that I can’t bear the simplest verbal communication. I worship silence and bask in it now, yet it’s true that 5 times today, for 90 minutes at a time, I was 100% present with the people in that class, gave them all emotion (and material) I could. I know one can always do more and better, especially better. Still I’m wondering if on an average day doing just enough could be enough, for learning and teaching to happen. And be reason enough for a teacher to not beat herself up. Whatever rules, patterns or guidelines it is that I failed to follow today, I refuse to believe it was a bad teaching day. I’ve just now read this post by Sophia Khan about an observed class, which was described as a synonym of waste by the observer, and all the eye-opening outcomes of that experience for the teacher in question. If my classes today had been observed, the verdict would have certainly been some stronger “northern” slang word. Yes, every class is an amazing opportunity to develop something. I’m grateful to Sophia for her post as it’s just what I need today, or these days: a clear picture of what happens in other classes and how. I don’t remember feeling that low in professional confidence in a long while. Sabbaticals have their faults.